Alas, the Theatre of Dreams that was the Copenhagen Climate Conference ended up being the Arena of Apathy. All that build up and hype, all that unprecedented participation by world leaders, all that hope and expectation... hmm. Where does that leave us? Us right here and us out there? On our bicycles. Muscling our way through a snowstorm, gliding through the summer light. On our bicycles. Cycling is part of the global solution. A tripling of cycling in Europe, at the expense of individual motorized trips, would eliminate 5% of C02 transport emissions. While we need municipal politicians to invest in infrastructure, it all starts with the individual. All you need is a bicycle. We are all two-wheeled, human-powered monuments of hope and action. I am completely agree with you. Revolution starts by one itself and then more people does the same, and in our case the action is very simple, just ride our bikes ! Wow! 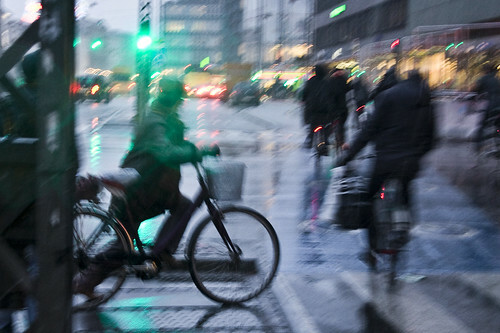 It's raining there but they are still cycling. As what I've known, cyclist run for a shed when there's a rain. 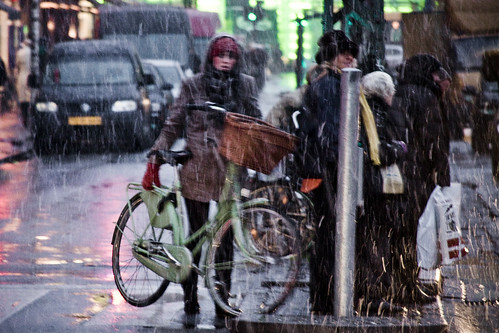 80% of copenhageners continue to cycle throughout the winter. rain, snow or shine. And I really admire that. This sunday morning, we had a terrible and unusual cold day around here (near Lisbon, Portugal). By 8:30, I was chilled by a 0º temperature and a freezing wind but a beautiful sunshine and blue sky. We're just not used to that and, although I didn't feel the need to wear pants, my hands asked for gloves and my feet were numb after the first kms (even in wind stopper socks). You guys really now how to cope with bad weather! 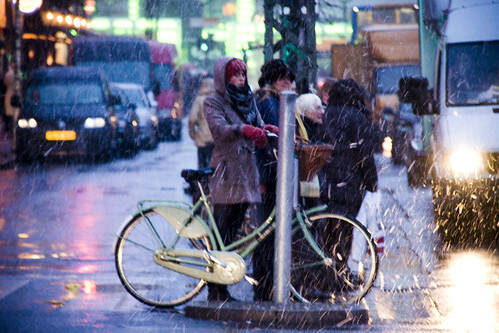 Love the bike and am in admiration of people who bike in all kinds of weather. Amen! I so wish NYC was as bicycle friendly as European countries we know. For now, I am doing my best to ride my fair share. You can't change the world. You can only change yourself. If you do it right, others will follow and that is what changes the world. Too bad the "I won't do anything if you don't do anything, so we both end up doing nothing cause that's what makes the profit" mentality is so pervasive. As long as world leaders negotiate it won't work. I believe Albert Tucker called this the prisoners dilemma. We can't pin our hopes on politicians leading change, that's for sure. Individuals have to make choices and exercise their collective voices to realize the changes they desire. Not enough Americans seem to realize that each one of us has a responsibility to make choices. I think we tend instead to wait for our elected officials to suddenly grow backbones and make decisions based on the long-term common good. I found out this website a couple of weeks ago, since I really want to start riding my bike as a mean of transportation, not only a hobby... and i might sound shallow, but looking at this fashionistas riding their bike, has definately motivated me even more... it's all about saving the earth, and looking good while doing it!! I'm from Mexico, and well, we don't have the appropiate infraestructure at all, but someone has to start pushing the goverment right? keep doing what yo do!